You are invited to join this year's LMS Academies. 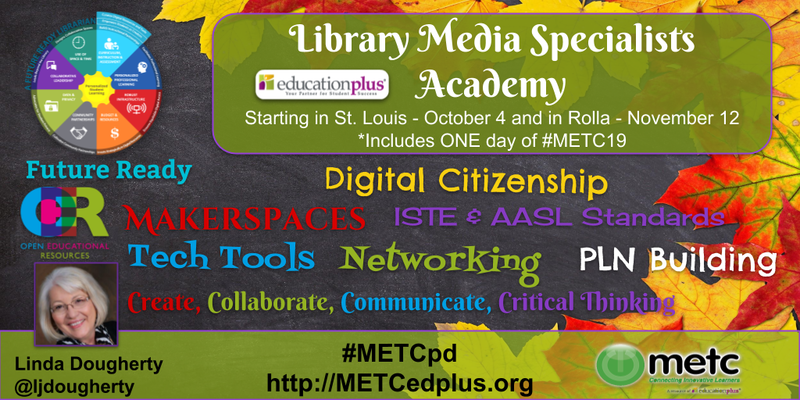 I'm looking forward to working with teacher librarians in St. Louis and Rolla. What topics will we be covering? • Research lessons that support the MLS, AASL & ISTE Standards, Future Ready Frameworks. The new crosswalks between the 3 national standards will be connected to your school library programs. • Examine problem based activities & resources pertaining to Makerspaces. Field trip to a local school library with a makerspace is planned for both St. Louis and Rolla. Join for a once a month meeting with your local librarians to share ideas and resources. Learn topics are trending in school library programs on a national level. Touch base with Missouri librarians who will part of your LMS network. For more information, click on the Academy listing in your area. St. Louis Academy will meet at Education Plus. The Rolla Academy will meet at the SCRPDC.